The average person sleeps for 9 hours a day and if you live for approximately 60 years this is an around 197100 hours. Which means we spend around 1/3 of our lives in bed sleeping. So we don’t have to tell you how extremely important it is to buy a good mattress. Buying the wrong bed can have serious long term effects on your spine. Do not be fooled by beautiful appearance of the bed itself. The important parts are the base and mattress. They will be supporting you for 1/3 of your life. Think of it as an investment in your health. Never buy a bed that you have not tried out first. Lie on the bed with a pillow and check that it feels good. It should not feel too hard or too soft. Couples need to make sure that the heavier partner does not create a dip, which the lighter partner tends to fall into. This means absolutely no sagging in the center of the bed should be seen. Price is no guarantee of quality, but a very cheap bed will not last long even if it feels good at first. Try to find a seller who can give good advice and checks your sleeping position on the bed. Springs or latex are a matter of preference, but springs are best if individual rather than connected and latex is better if strengthened with a cork or other natural layer between the latex layers. The number and placement of coils in the mattress determines the level of support, while the amount of padding on the mattress determines the level of comfort. Do not let the words medical or orthopedic fool you. Many bed manufacturers have used these words to help make their products sell better. Who controls how they package their product? It is not always a sign of a good bed. Mattresses should not be too hard. 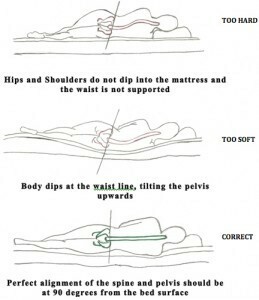 A recent study in Spain revealed that back pain sufferers slept worse on a harder mattress than a medium hard one. Sleeping on a mattress that is too hard exerts additional pressure on the back, resulting in more back pain for some patients. Research was published in the Lancet. Sagging old mattresses should have been replaced a long time ago. There is no other choice but replacement. Pillows should not sag under the weight and humidity of the sleeper. Latex, shaped pillows provide good lasting support for side and back sleepers. A whole debate is currently going on about the materials used in mattresses. Once natural materials were used but now most are constructed from petrochemical based materials, which are said to gradually give out carcinogenic and mutagenic micro chemicals. Since we are in close proximity to the warm moist mattress for eight hours each night, we may be at risk from this kind of pollution of our bodies. Many companies now offer organic mattresses, which remove this potential health problem. Consider this carefully for yourself and especially for children. With the variety of beds and mattresses on the market, personal preference in terms of sleep comfort and back support should ultimately be the guide for those with back pain and back problems as well as those who want to remain pain free. Remember no one type of bed is right for every body type and condition, so the more good beds you can try the better your final decision will be.